There were no immediate reports of injuries from the wreck that occurred about 8:45 a.m. EST, but the fumes caused several people to seek treatment at a local hospital, authorities said. The blaze produced a massive column of black smoke in the area, which has a mixture of residential, industrial and rural properties. Television footage showed several blazing cars stacked across the rail lines and flaming liquid flowing down ditches from the mangled tanker cars. 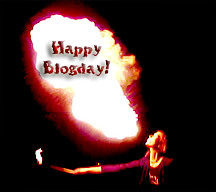 January 18, 2007 Happy Blogday! Yes, it is true- this blog is four years old today! Lots of content here, and i am sure lots of broken links along the way. Maybe it is time to move to a commercial application!